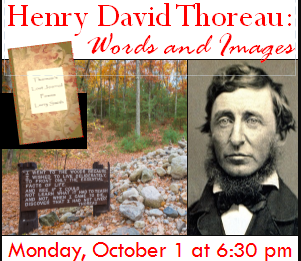 On Monday, October 1 at 6:30 pm Dr. Larry Smith, professor emeritus of Bowling Green State University, author, editor-publisher, and biographer, will present a program on “Henry David Thoreau: Words and Images.” Smith has researched Thoreau at Concord, Massachusetts and at the Thoreau Institute and Walden Woods. His recent book, Thoreau’s Lost Journal: Poems, was released in an enlarged edition in 2018. He will present the story of Thoreau’s life through quotes from his writing and through slide images of Nature. Smith will also read from his new book. Please register here.